Process development is streamlined by using Praesto MiniChrom columns, pre-packed with your choice of Praesto modern, high flow Affinity or Ion Exchange resin, enhancing both time and cost savings of MAb platform processing. Praesto MiniChrom columns are designed for process development and parameter screening, as well as for small scale purification or sample preparation. MiniChrom columns are packed and delivered ready for use. They are 100% quality checked for HETP and asymmetry. Individual laser labelling ensures traceability to corresponding resin and column performance data. The columns are made of biocompatible polypropylene. 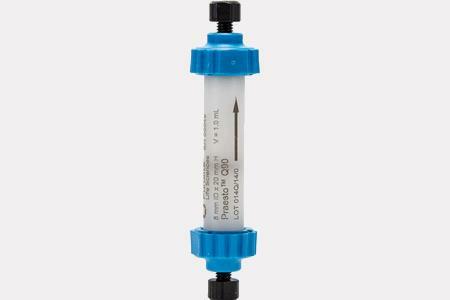 Praesto MiniChrom pre-packed columns provide a small bed volume for fast results and minimal sample and buffer consumption, as well as convenience in media screening and easy, direct connection to most chromatography systems.